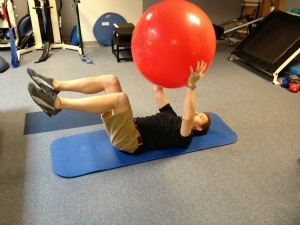 Adding an exercise ball to your core exercise routine is another way to take your golf weight training program to the next level. 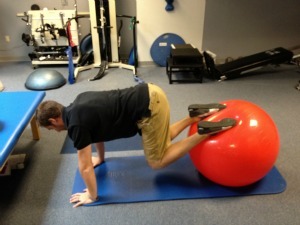 One great thing about using an exercise ball for golfers is that you can mimic the trunk rotation motion that is a huge component of the golf swing. 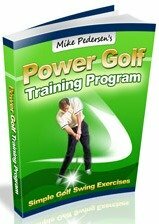 Strengthening these muscles with help prevent overuse injuries and will contribute to developing a more powerful golf swing! -Start in a tall kneel position with ball resting on the ground directly in front of you (for comfort, place something soft under your knees). -Tighten your core muscles and slowly push the ball away from you, but keep your hands on the ball. This will cause you to lean forward, pivoting on your knees (it is very important not to bend at your hips during this part!). -Roll forward until your muscles start to twitch and you feel like you can go no further and hold 5-10 seconds. Then return to the starting position. Repeat 10 times. -With the ball on the ground, lie on your stomach on top of the ball. Have both your feet and hands touching the ground and your back in a neutral position. -Slowly extend your left arm and right leg and hold briefly. Return to starting position and then extend right arm and left leg. Repeat 10 times with each side. 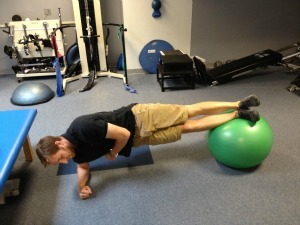 -Start in a plank position (facing the floor, supported by both arms, knees straight, and feet resting on ball). -Next, pull your knees forward toward your hips by rolling the ball. Return to starting position. 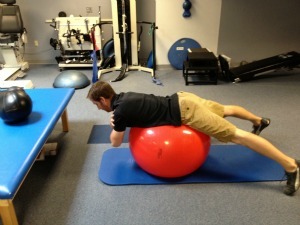 Prone Back Extension : Lie on your stomach on top of the ball. Keep your feet wide for stability. Place your hand behind your head and slowly arch your back. -Lie on your back with knees bent and the ball on the ground behind your head. 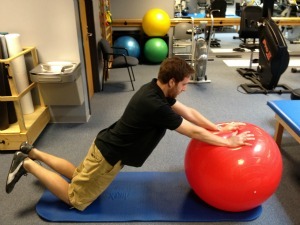 -Grab the ball with both hands and slowly move the ball towards your waist, while at the same time elevating both legs. -Place the ball between your elevated knees, hold, and lower legs to the floor with the ball while returning the arms overhead. -Repeat the crunch but this time grab the ball with your hands and return it to behind your head. -Start in the plank position (facing the ground, supported by locked arms, knees straight, with ankles resting at 11 and 2 o'clock on the ball). 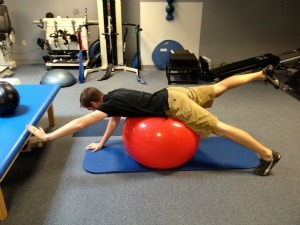 -Rotate the ball by twisting at your hips. Your left foot moves to 12 while right to 4. Rotate to the opposite side. 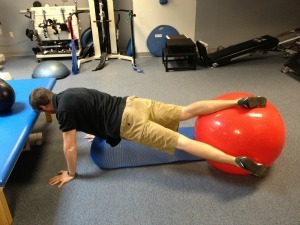 -This is a challenging core exercise! Lie on either side will the ball positioned at your feet. -Lift both legs and rest them on top of the ball. -Elevate your hips/pelvis off the ground, will feet supported by the ball, and upper body supported by your bottom forearm/elbow. -Target a hold time of 10 seconds. Perform as many reps as you feel comfortable with and then switch sides.